Busy, busy, busy…… but is it really something to be proud of? And at what point is being a busy bee actually affecting your health, happiness and fulfilment? I work with women everyday who are experiencing anxiety, depression, sadness or a lacklustre feeling that life just isn’t all it should be…. the common theme with at least 75% of them – they are so busy being busy. In fact their commitment to being busy is directly impacting their contentment from life as they feel guilty for doing things they love due to a feeling that doing these daily tasks that keep them busy is a prerequisite to their life. With the rise in use of social media and the internet we know we can effectively work 24/7. We can Christmas shop at 4am, we can chat to friends online at 11pm there are no longer 9-5 limits on life like there used to be. BUT what impact is it having on our health and life? Are we addicted to being busy? Doing things at all times of day and night? We have found ourselves in a society where so many people are fighting to prove how ‘busy’ they are, almost as though it as a band of honour to show how hard they are working – but what is the impact of trying to maintain an impossible pace of life and a never ending to do list – Is it time to work SMART rather than be busy? Is it time to live and make memories rather than be part of a rat race which limits our life-work balance? In order for us to feel fulfilled (and happy/content) there needs to be a balance across all six areas. This allows a sense of peace and satisfaction to be achieved. However when we allow ourselves to be ‘busy’ we can often be worrying about things that haven’t even happened yet, or allow ourselves to be overwhelmed by things that aren’t a priority. For many people this can create feelings of anxiety, fear or overwhelm and in some cases a sense of failure as their ‘busy’-ness is preventing them from enjoying other aspects of life. So how can we start being LESS busy? STOP! Being busy creates more busy-ness and as such we find ourselves in a never ending cycle of being ‘busy’ so step 1 – STOP. Step out of your life and look at what you are actually doing with that busy time. Reflect with a partner or friend on where you could save time or energy and downsize some tasks to give yourself some downtime to do things that you enjoy and ask yourself some simple questions? Is it necessary? Could it be simplified/reduced/less frequent? STEP #2 – Book less! Book chores in cycles – you can save a lot of time and prevent undue ‘busy-ness’ by booking your chores in cycles. If you know you have a supermarket shop, the dry cleaners and the post office to visit – do them in one cycle to save yourself the time of going in and out the house. You could save yourself up to an hour of driving back and forth by doing them all in one loop. STEP #3 – Take time out! 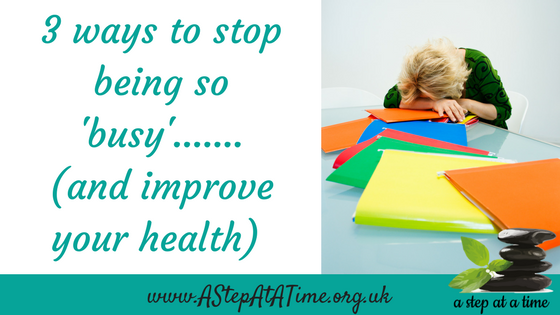 Being busy constantly leads to exhaustion, overwhelm, anxiety and a general sense of non-achievement. Long term it will also impact your health emotionally and physically. After all if we are always busy we are never finishing anything and we cannot step back and enjoy things. Once a fortnight/month book yourself a day of pleasure! No chores, no jobs, no commitments, no work, no back to back appointments – a day doing things that YOU love. If that means lying on the sofa all day – do it! If it means walking the dog to the local pub – do it! If it’s a trip to the seaside with the kids – do it! Just give yourself a day of guilt-free indulgence doing something that you enjoy. It’s vital to your spiritual and emotional health and allows you to re-charge and re-focus. It also allows your brain to slow down and to get life back in perspective – after all – is any housework as important as watching your children smile? or making memories? STEP #4 – REPEAT WEEKLY! Taking conscious action to remain in control of your own life is paramount to preventing everything spiralling. If you struggle to decide what is a necessity and what is simply a busy habit booking a life coaching session can be a great way to get everything back in context.